I have quite the backlog of reviews to do, and I haven't had much time lately to do them. I've been sidetracked by a few things, but I'm trying to finally sit down and taste some teas. I like to taste a tea a number of times before I review it, to make sure I get a good feel for the leaves. For this festive holiday week I bring you a review for Art of Tea's oolong rose. This isn't a tea I'd normally gravitate towards because I'm not a big fan of rose in any sort of food or drink preparation. But, I've been recovering from a medical procedure and the idea of soft, fragrant rose petals felt soothing and uplifting. It's also been very cold and grey outside so thinking of vibrant flowers helps warm the spirit. 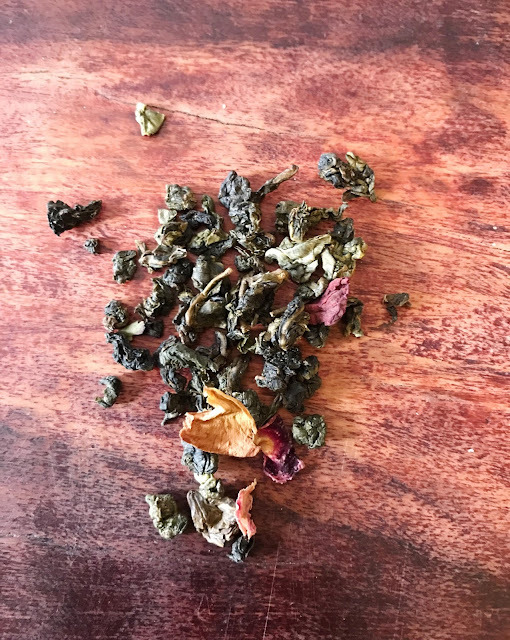 So, oolong rose went into the pot. 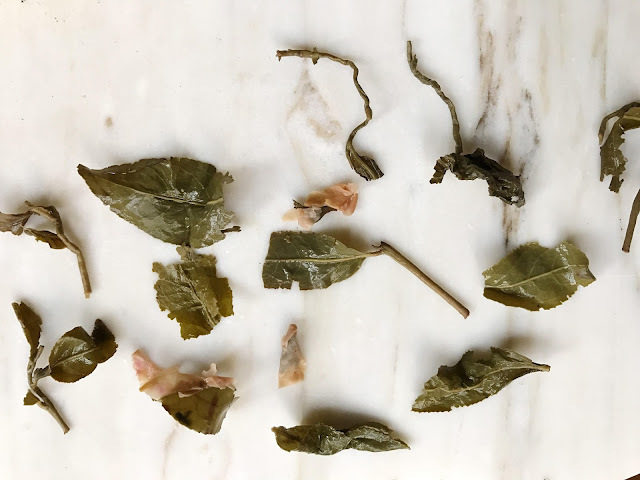 The tea leaves are tightly rolled and on the greener side of oolong. 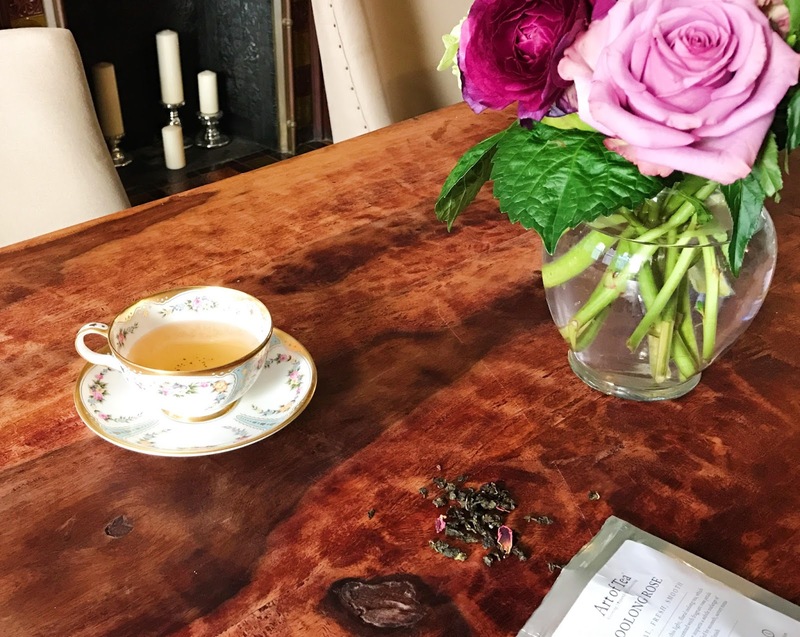 There are pretty pink petals laced throughout the tea. The dry leaves smell mostly of sweet rose, which is a scent that I enjoy but also find to dominate any situation. The brewed tea smells fuzzy (I've decided that yes a tea can smell fuzzy), comforting, and warm. I'm getting a bit of vegetal flavor but not much else. Very smooth without any astringency. It's hard to tell if the floral flavor belongs to the tea leaves or is all coming from the rose petals. This is a very pleasant tea, even though it's not something I'd often choose for myself. It's a nice choice for an intimate gathering, and would make a nice hostess gift. As I anticipated, this tea feels soft and gentle. It's a soothing sip that comforted my body. 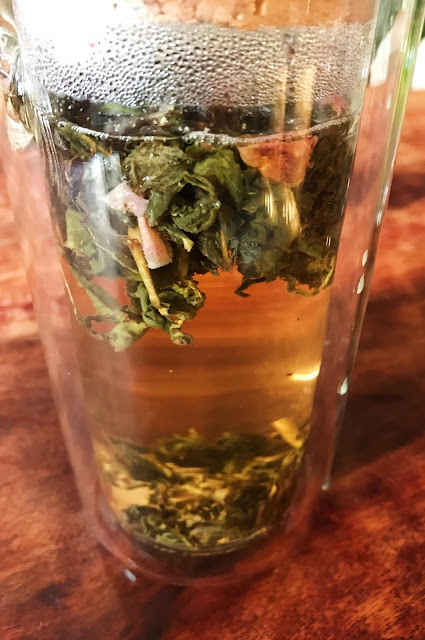 This is a delicate tea and really only for you if you love drinking the flavor of roses. The rose does get a bit overpowering for me, even though the aroma is quite alluring. I loved inhaling the lingering scent. Thank you to Art of Tea for the sample. I have a few more to try, so stay tuned. I hope everyone is enjoying the holiday season! Best wishes to you all! Welcome back, Sara. Sounds like the tea to lift the doldrums. Thanks Georgia! I hope to have more free time for blogging in 2017! Hope to see you soon.